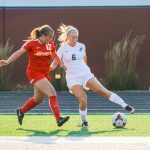 With a record of 3-1-2 in conference matchups, the University of Indianapolis women’s soccer team is off to a great start, according to Head Women’s Soccer Coach Holly Cox. 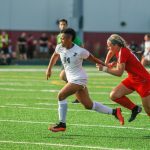 The women fell short to the Bellarmine University Knights on Sept. 24 in Key Stadium. The game ended 2-0 in favor of the Knights, despite shot attempts from junior midfield/forward Sierra Singer, junior midfield/forward Stephanie Burdsall, sophomore midfield/back Carah Kreimer and junior forward Ashleigh Lewis.The Knights scored their first goal in the 43rd minute, right before the halftime break. Bellarmine closed in on the Hounds and scored once more in the 78th minute before taking the game. 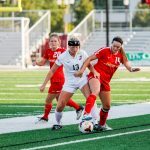 Prior to their loss, the women tied with the University of Southern Indiana Screaming Eagles, due to a last minute goal from Lewis. The first half remained scoreless, despite the multiple shot attempts by each team. Both teams combined for a total of 17 attempts, but neither found the net. 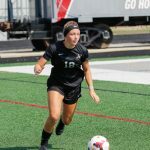 The Screaming Eagles scored the first point of the game in the 72nd minute, but Lewis quickly answered back with her goal 18 minutes later. Going into overtime, both teams were again scoreless and finished the game 1-1. According to Cox, the team is now focusing on attack to improve in situations like this, and hope to score more in these necessary moments. The team’s only conference loss this season was in overtime against the McKendree University Bearcats. 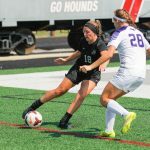 The Greyhounds had 1-0 lead 85 minutes in, until the Bearcats responded with a goal to send the game into overtime. The Bearcats then scored in the 102nd minute on a penalty kick. According to Cox, the Hounds have been working really hard on their defense and now need to switch gears and focus more on offense. 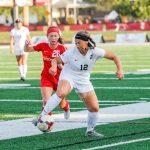 Cox said she has been surprised by freshman midfield Taylor Peck’s transition from high school to the collegiate level and sees Peck as a great asset for the team. Peck already has received a lot of playing time early in her freshman year. She said its challenging to adjust to the collegiate level, especially when playing certain positions on the field. During the off season and through the summer, many of the women participate in lifting and training to build and prepare for the next season. They work with the coaches and athletic trainers to build muscle during this time. As a freshman, Peck did not have the opportunity to do this work to prepare for the season but has worked with weights on her own for years. “Starting my junior year of high school, I decided I wanted to start lifting. So I would lift almost everyday for awhile,” Peck said. Peck said she was recently injured with an ankle sprain and has been out for the past few games. She said she hopes to return within the next week. She understands the hard work it takes to play at this level and plans to work hard to get back in the lineup. “I’m doing everything I can right now, by icing and elevating [the sprained ankle], to get back as soon as possible,” Peck said. The Hounds will travel to Kenosha, WI to take on the University of Wisconsin-Parkside Rangers on Sunday, Oct. 1, at 1 p.m.